Greetings and salutations, everyone; yes, once again it is I, your popular host, Mani the purebred border collie, here this evening to tell you all about my day. You may remember me from such posts as “Weirdly Lit”, among so many, many others. Here I am in a characteristic pose. It was a very nice day today. I need to go back to yesterday (which I guess is the desire of most humans, isn’t it?) to show you that some genuine garden-related activity has taken place recently (instead of just a lot of sighing). 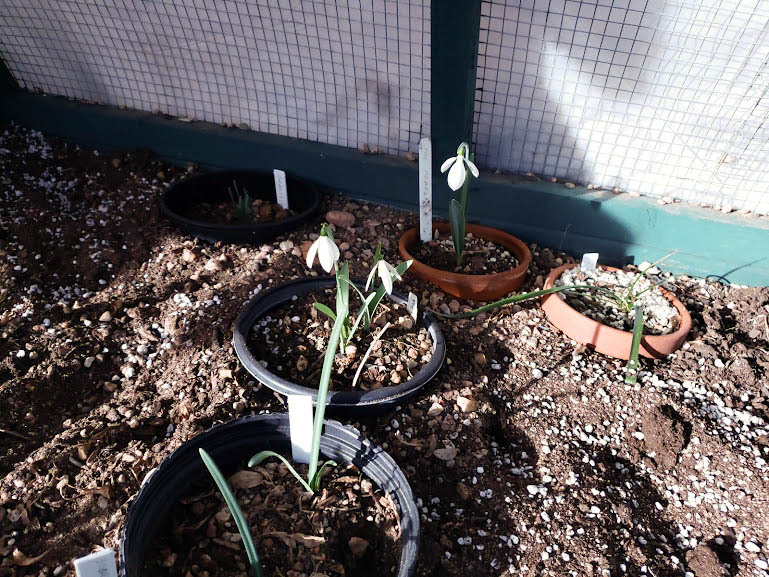 Some eremurus seeds were sown. Eremurus spectabilis, to be precise. 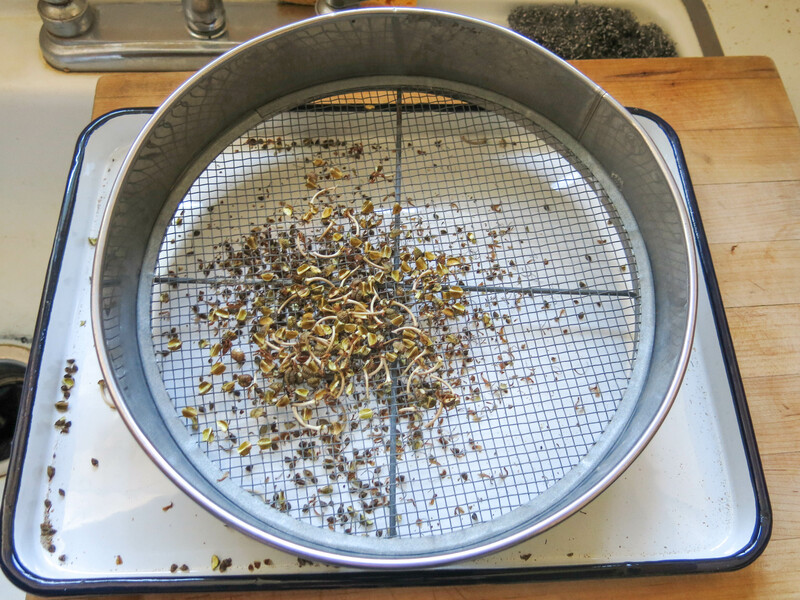 The seeds were run through a sieve to get rid of most of the chaff. A horticultural sieve, no less. 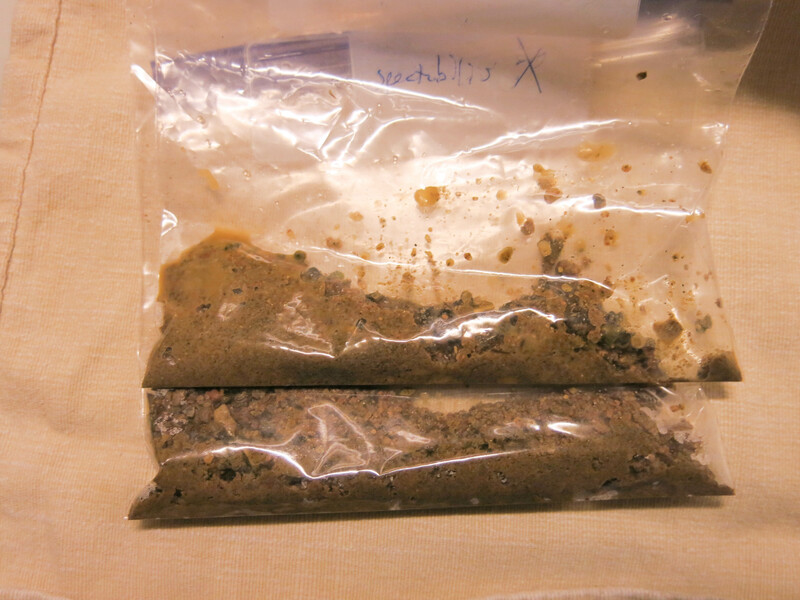 Then the seeds were mixed with some coarse sand (paving sand, purchased at a box store). The sand was slightly dampened. 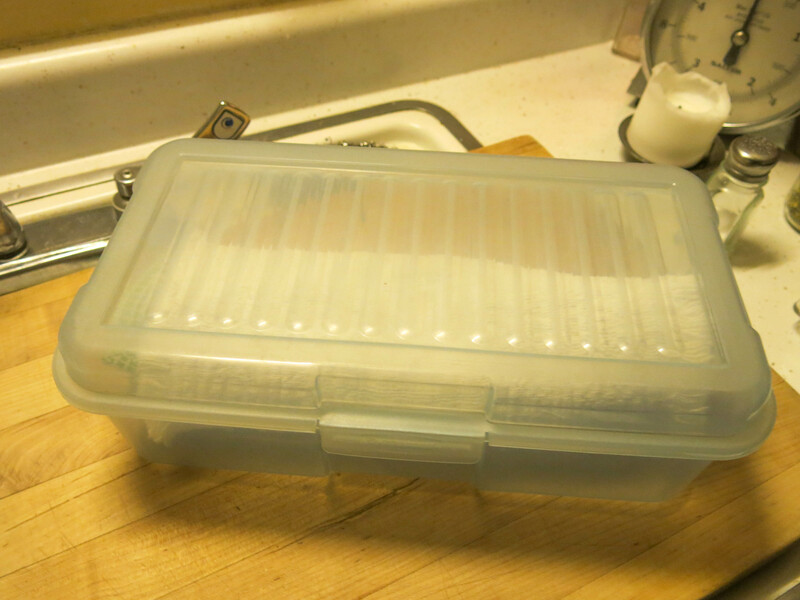 Then wrapped in a towel (to keep the bags from freezing), put in this container, which went into the crisper drawer of the refrigerator. The seeds will be checked for germination in about a month. Or they may just be sown into pots at that time, and put on the shelves upstairs. I’m not sure which. Well, that was the gardening. Now back to today. The guy I live with has become kind of irritable, which is a side effect of the treatment he’s undergoing. Lots of expletives. He has also been having hot flashes. But anyway, it was so nice today that we did go out into the garden to look at stuff. 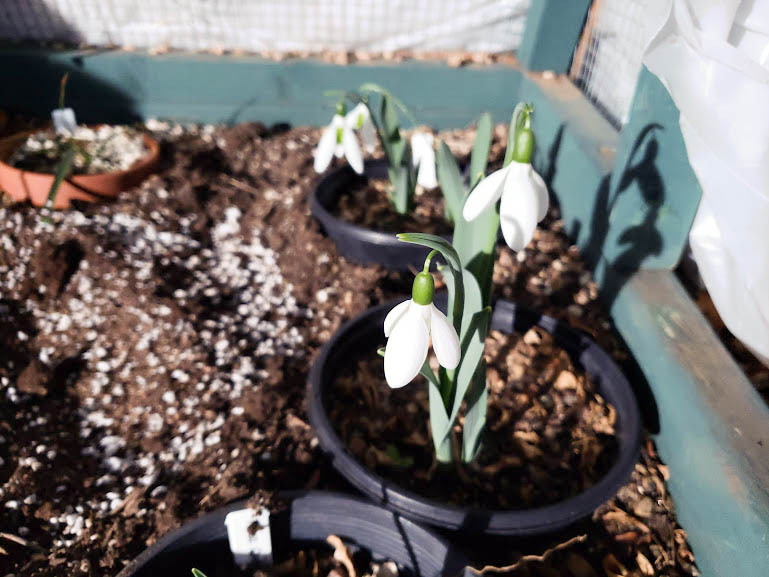 There are quite a few snowdrops flowering in the Snowdrop Frame. Not very good phone pictures. As some of you may know, there has been endless complaining about the snow, and no place for snowdrops to be in flower out in the garden now, which is unusual for here (more expletives), and while we were looking around the garden there was a steady stream of whining and berating the “awful snow” and all that, and how there was no place at all which wasn’t free of snow so there might be snowdrops, and, well, um…. The guy I live with stood and stared at this area for quite some time. Then he said something rather more loudly than maybe he ought to have. Not the sort of thing one hears from gentle gardeners. This is the sand pile. The picture isn’t very good, because he still hasn’t got the measure of the new phone, but the north side of the pile is where it looks like depressions from someone’s knees when they were planting seeds there just today. So he was right there just an hour or two earlier and didn’t even think of this. 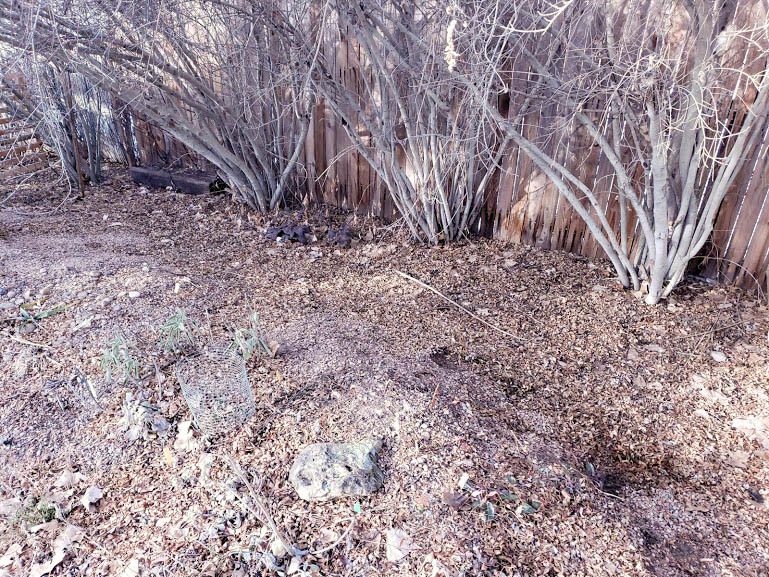 Between the north slope of the sand pile, and the trunks of the New Mexican privets there, is an area which is, oh, you know, obviously empty. There is nothing there. (There are some crown imperials, Fritillaria imperialis, planted there, but they flower later.) 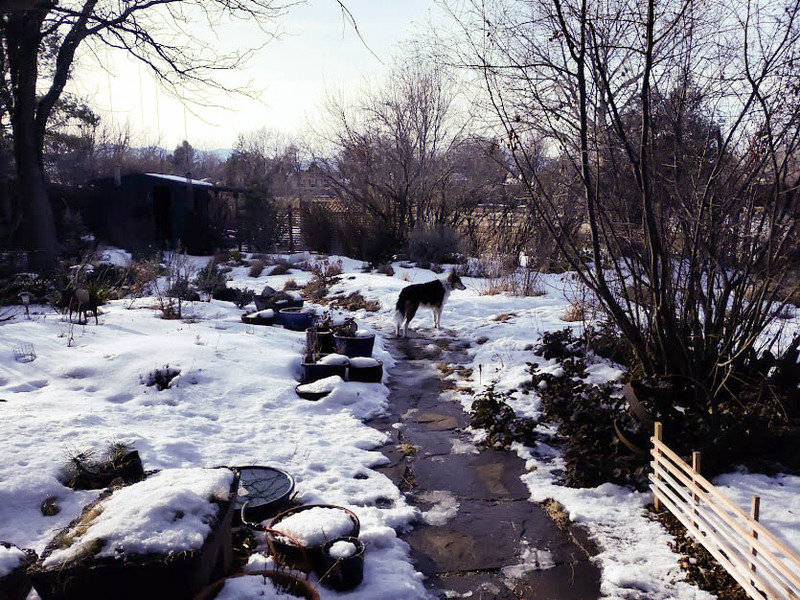 And there is no snow, even though the rest of the back yard is covered with the stuff. 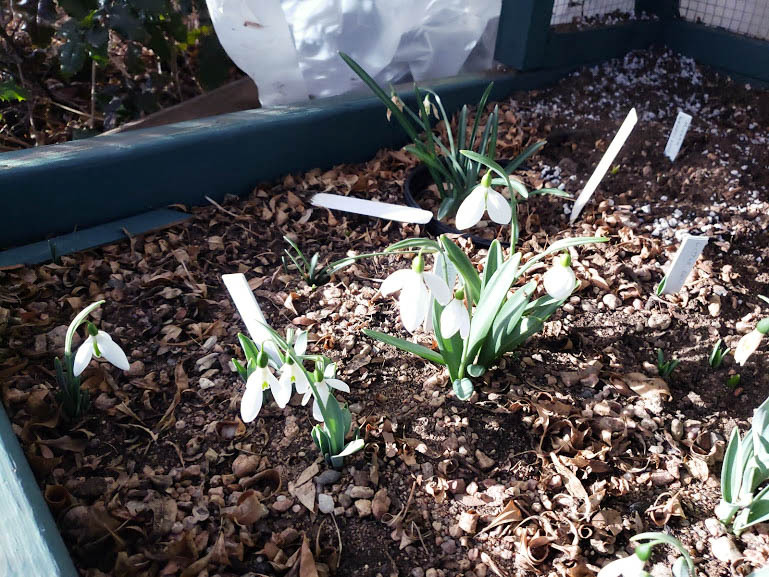 There could have been snowdrops planted there for years. And they would be flowering now. All of the autumn-flowering species could be planted here, too. Again with the expletives. You can guess how quickly this situation will be rectified. Eventually it was time for my walk. We had to stop at a neighboring house (people I really like) to tell them all about everything (except for the snowdrop business), and of course look at sleeping owls. 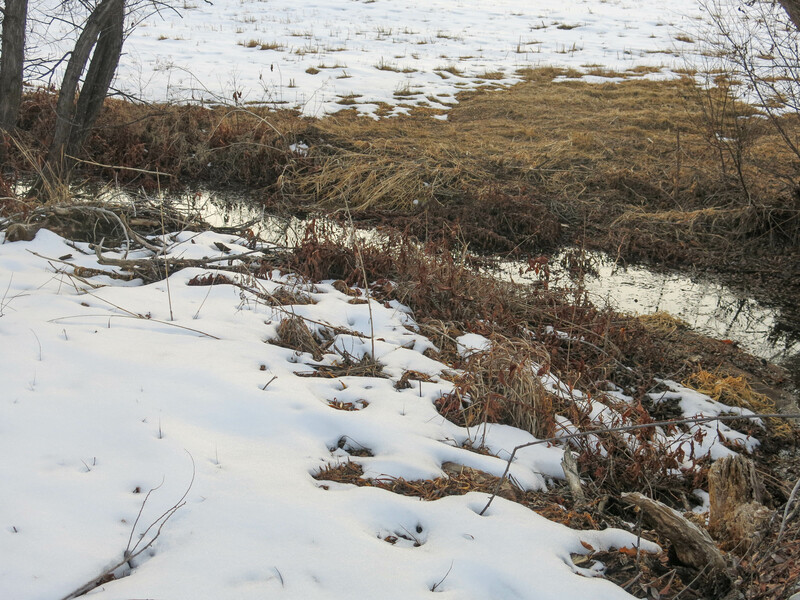 I wanted to go down the coyote path behind the house, so we did. There was some water in the creek. 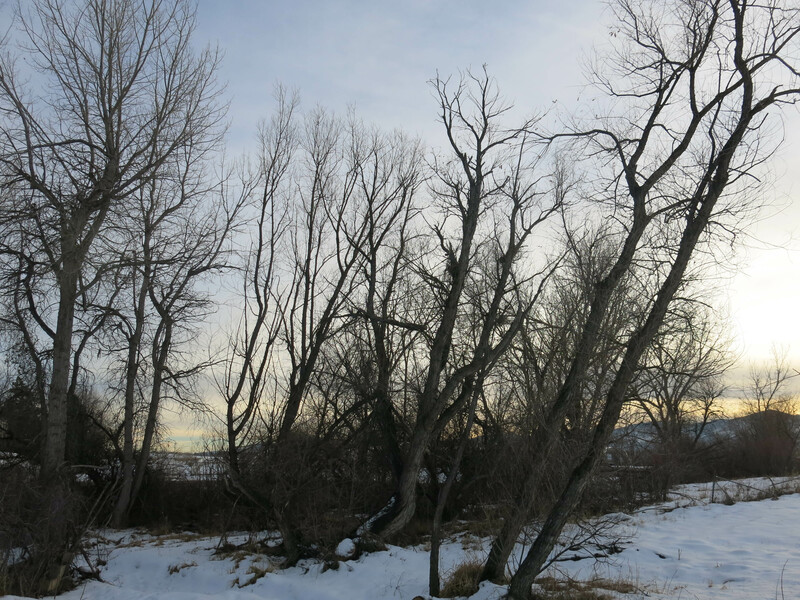 The willows at the end of this walk. The path stops here. We could go left, and up to the street, but we turn around instead. On the way back home, the guy I live with made me stop on the sidewalk so he could make a movie. 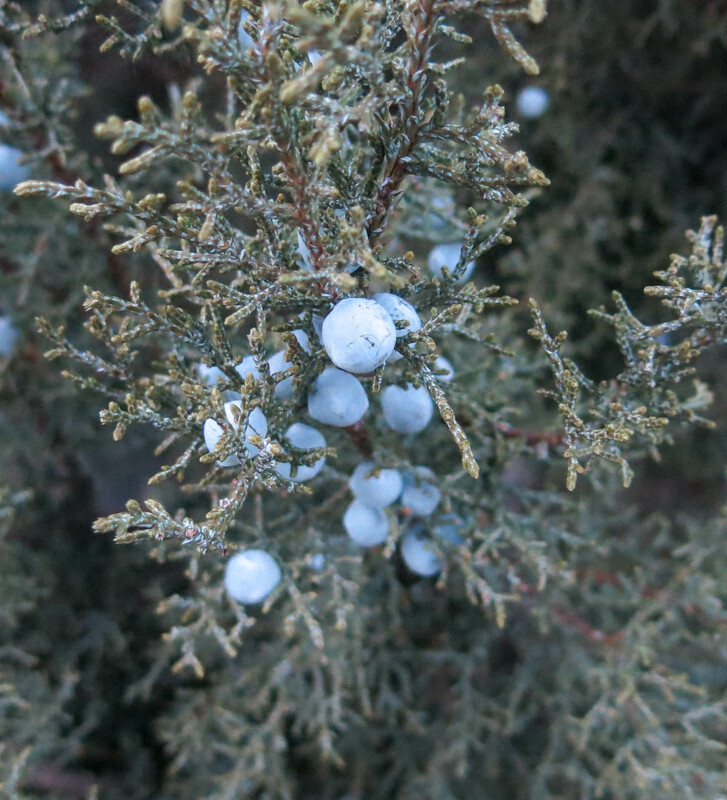 He took a picture of some juniper berries (Juniperus monosperma) in our front yard, first. There is an awful lot of traffic noise from the highway, half a mile or more away, in this movie. He doesn’t know why the camera makes this traffic noise so loud. So that was my day, expletives and all. June right there in Denver. If he is feeling better of course. But most likely you would have to go to day care, and he has probably seen most of the gardens on the tour. But if we Bloggers got to meet you Mani, it would be a highlight of the trip. Woo, I grow faint at the prospect. Contemplating taking up a position of garden blogger. Who do I assure I can fling with the best o’ them? We don’t know the answer to that question. Thanks; I have to agree that I would be the highlight of the trip. The guy I live with says that’s immodest. It’s not very likely that we’ll be participating, though we will here, I guess. 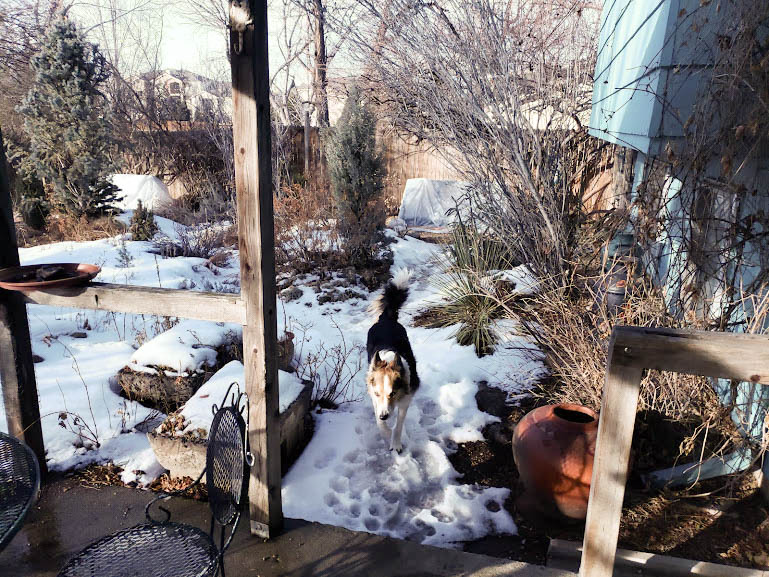 Our garden was on tour a couple of years ago and the guy I live with said I did a very good job of showing people around, like Chess did, despite my initial apprehension. Hoohoohoo-ing beats expletives – loud, soft – any day. You might remind the guy you live with, Mani, irritability is just one among many emotions and their gradation, so expect to feel a hormonal spectrum. Gee, won’t that be fun! These posts of yours, dear dog, assume a gentle rhythm for me, snowdrops and owls and walks and characteristic photographs. Nice to know you and the guy are such neighborly, sociable beings. Do you know about juniper berry chicken stew? You could throw a potluck for the hood. Love the light of sun on snow, and you are such a stately love in your photographs. Thanks. I try to be stately. Or sometimes noble. There was a time when the guy I live with and another neighbor planned to have a neighborhood barbecue contest. But those neighbors moved away. You certainly sound good for someone who must deal with such unpleasantries. Expletives can be so disheartening. It is fortunate that your sort are so proficient with such matters. I know that Rhody always knows what to do when I get that way. The guy I live with sometimes has to apologize when he goes on one of his rants. Like when the shelf downstairs collapsed and a huge bag of rice along with a bunch of broken glass fell all over the laundry room floor. I had to hide. Well, that is worth ranting about. If I rant, Rhody wants to play. The guy I live with says being careful with one’s speech is very important. Not that he always practices what he preaches, of course. Well, he is probably more careful in public where others might hear. I know I am. Rhody does not have such problems. His vocabulary is quite limited. Sometimes he is. Though, when you get old, people just think you’re weird if you blurt out stuff. Some of us do not need to be old or blurt out stuff for people to think we are weird. Meow meow yore PawPaw an mee LadyMew cuud tern THE air blue with their ‘swearin’. LadyMew can get furry color full with her werdss. Mee not even sure what sum of them meen? 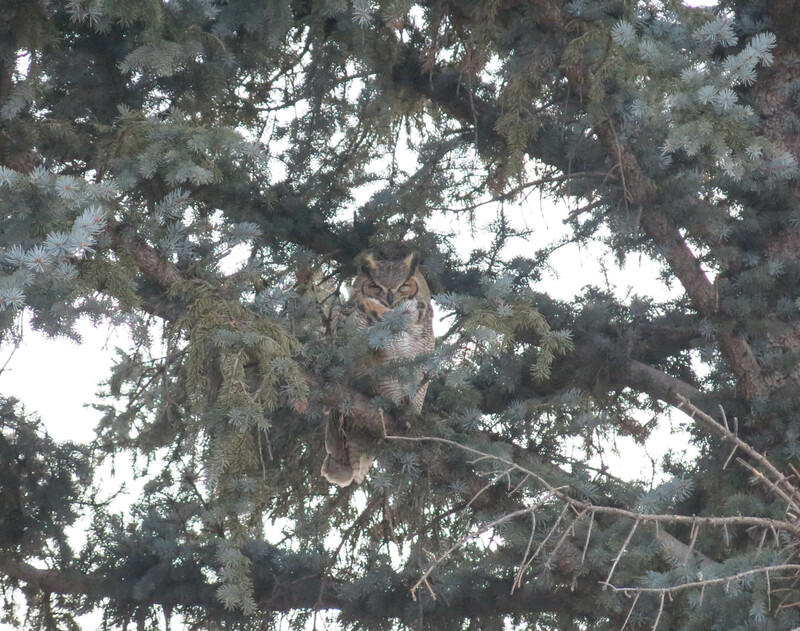 An Hooty Owl lookss so cozy upss inn his tree. 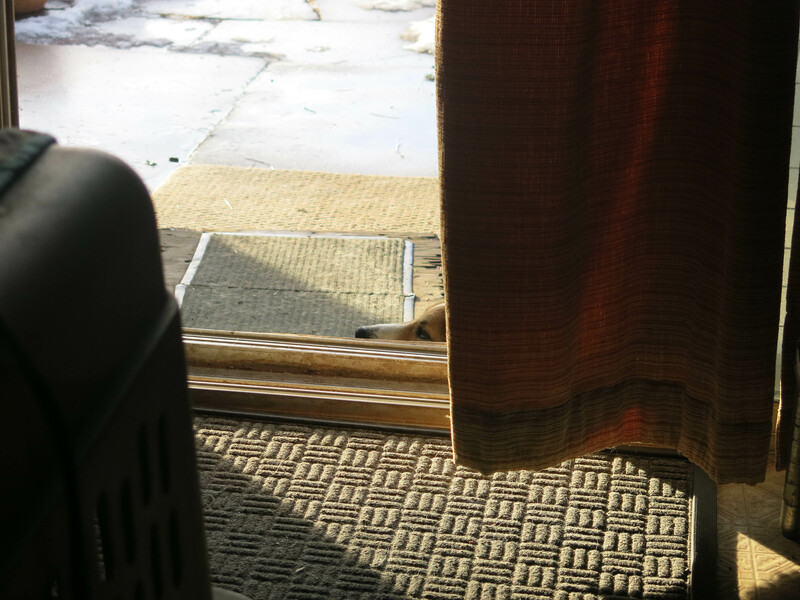 Iss like havin a guud frend watchin over you. It’s supposed to snow here this evening. Again, after a really nice day. That’s the way it is here. The temperatures get to spring-like, and then it snows. And then certain language is employed. So yore PawPaw does not like snow?! LadyMew doess a funny wiggley dance when it snowss…….shee REELLY likess it! WEERD rite Mani??? Wee supposed to have more ‘weather’ tonite an tomorrow…..you nevurr know inn Canada…..mew mew mew…. Not even slightly likes it. I, of course, love it. It snowed last night. They said “winter storm warning”, but it was like a centimeter. Wee had a reel storm Mani…over a foot of snow!! An now rainin an then furreezin rain to come an more snow! Iss furinallee Winter here! Mee not fussy on snow…mee bin out inn it a long long time ago an cold an shivery an all alone. Maybee yore PawPaw feelss that way??? The guy I live with worked outside for the telephone company so he is used to freezing his hindquarters off. But that was a long time ago and he’s old now. The cold gets to him more.